Budget travelers in France or The Netherlands may consider non-stop service from Paris / Amsterdam to New York on Norwegian, continuously awarded as best Euroepan low-cost carrier. Non-stop flights are now available from €290 incl. all taxes. As mentioned this is budget solution as there is no in-flight meal nor checked bag included in base fare. (Available for additional €140 both ways..). Limited availability at the beginning of end of summer season. If interested in this solution with Norwegian look for limited options in May and June or September and October 2018. 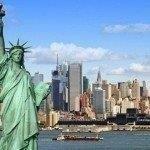 Need an accommodation in New York we recommend Booking.com or Hotels.com. Booking sample of cheap norwegian non-stop flights Paris / Amsterdam to New York from €290! Your outbound flight from Paris to New York will be on 28th of September 2018. You will return on 11th of October.